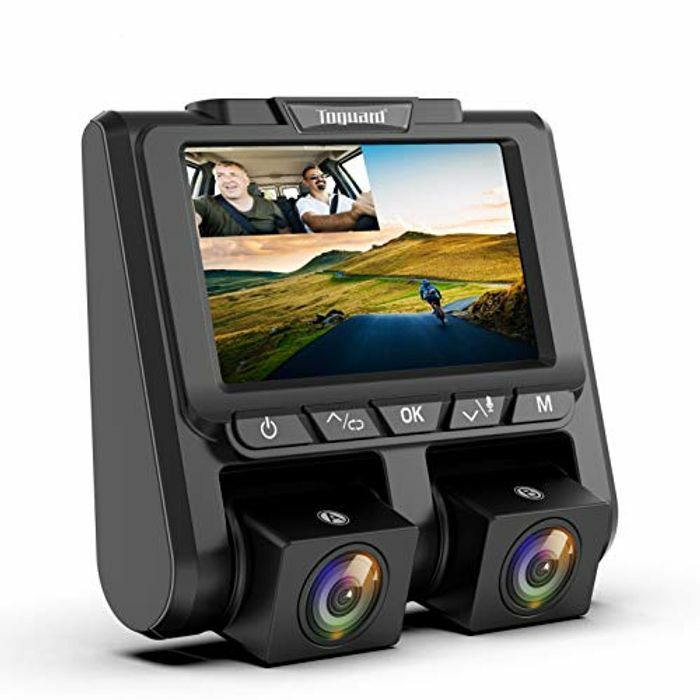 【Dual 1080P Dash Camera with Audio for Uber Lyft Taxi】Both FHD 1080P front and cabin in-car dash cameras with Advanced IMX323 sensor simultaneously record the road and inside the car, which provide sharp high quality video/picture. Dual lens dash cams provide powerful evidence in case you have an accident and single lens can record 2160P UHD video, capturing license plates clear. 【340° Wide angle & 360° Rotatable Cameras】Based on the each 180° rotatable dual dash camera, it is more convenient and user friendly for you to adjust the angel. The two 170° wide angle lens captures the whole road and license plates of other cars in front of you from the edges of your windscreen, and recording what is happening in the cabin simultaneously during the day and night. Perfect dual lens dash cams for car, cab driver, taxis, Uber and so on. 【24 Hours Parking Monitor & Motion Detection】Triggered by the parking monitor and motion detection, the dual dash cams will automatically turn itself on and starts recording when it detects motion in front of your car or someone crashes your car while it is parked. Excellent audio recording with built in microphone can provide perfect proof if someone damages your car and gives you peace of mind after you left your car. 【Continuous Loop Recording & G-Sensor】Seamless loop recording will automatically overwrites the oldest footage and replacing it with the new videos, so there's no need to worry about your memory card running out of storage space. The G-sensor(smart record emergency lock system) is a great feature that if any sudden braking or bumps caused an accident the footage will get locked and saved. This can be used as evidence and insurance claim during car accidents. 【Two Ways to Install & Reliable Service】 This dash cam comes with two 3M adhesive stickers and one suction cup, so the ways of mounting is very flexible, you can choose the best way to install this camera, and you can check and learn clear about how to install in the 7th picture of product page. Also, we support 30 days money back and 12 months warranty, professional after-sale service, you questions will be replied within 24 hours. Thanks so much for sharing, I ordered one.